Practical and easy to use, you’ll love its soft, subdued lighting, making this diffuser an excellent decorative object. This essential oil diffuser works by misting the water. A few drops of essential oils added to the water is enough (15 drops maximum) to diffuse their scent and beneficial properties around your room. Ultrasonic misting produces a light mist of water that diffuses the essential oils and pleasantly humidifies dry air. Thanks to its misting technique, it can diffuse over an area up to 30m². The misting is caused by the vibration of a very high-frequency ceramic chip which causes ultrasounds by its movement. 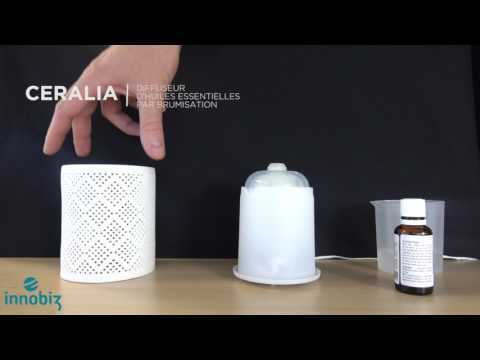 That’s why the Ceralia diffuser uses ultrasonic misting. This ultrasonic misting is therefore what diffuses the essential oils. The device should be placed on a flat, level surface. Connect the AC adapter to the diffuser without plugging it into a mains socket. Remove the ceramic casing and cover. Use tap water at room temperature (no demineralised water) to fill the base reservoir with no more than 80 ml (do not exceed the maximum level mark). Replace the cover, then the ceramic casing, onto the base. Plug the AC adapter into a mains outlet. To start your Céralia, simply press on the top of the device. This will activate the ""foot-button"" located under the device. Make sure your device is turned off. Unplug the AC adapter from the mains outlet, then disconnect the AC adapter from the Céralia’s base. Empty all the water left in your Céralia. Use a clean cotton bud or soft cloth to clean the inside of your Céralia; be careful not to press too hard on the ceramic disc; this item is fragile. Such cleaning is recommended after every 3 uses. Do not activate the diffuser in the presence of children under 6 years or pregnant women. In a child's room, we recommend that you do it when they are not there, and at least 30 minutes before they come in. Do not use chemical fragrances, just 100% natural essential oils. - Do not pour more than 15 drops of essential oils into the device.